This HCUP Statistical Brief presents data from HCUP Fast Stats on the national rate of opioid-related hospital inpatient stays and emergency department (ED) visits from 2005 to 2014. Rates for more than 40 individual States and the District of Columbia are provided for 2014 along with changes in rates for the 6-year period from 2009 to 2014. Identification of opioid-related stays and visits is based on all-listed diagnoses and includes events associated with prescription opioids or illicit opioids such as heroin. Differences greater than 10 percent between estimates are noted in the text. Figure 1 presents the national rate per 100,000 population of opioid-related inpatient stays and ED visits from 2005 through 2014. Between 2005 and 2014, the national rate of opioid-related inpatient stays increased 64.1 percent and the national rate of opioid-related emergency department (ED) visits increased 99.4 percent. Across States, the rate of opioid-related inpatient stays in 2014 varied more than five-fold. The highest hospitalization rates occurred in Maryland (403.8 stays per 100,000 population), Massachusetts (393.7), and the District of Columbia (388.8). The lowest rates occurred in Iowa (72.7), Nebraska (78.6), and Wyoming (96.7). The rate of opioid-related inpatient stays increased in most States between 2009 and 2014, with the greatest increases in Georgia (99.8 percent), North Carolina (70.9 percent), Oregon (60.2 percent), Washington (60.1 percent), and South Dakota (59.6 percent). Across States, the rate of opioid-related ED visits in 2014 varied 10-fold. The highest rates occurred in Massachusetts (450.2 visits per 100,000 population), Maryland (300.7), and Rhode Island (298.3). The lowest rates occurred in Iowa (45.1), Nebraska (52.8), and South Dakota (63.1). The rate of opioid-related ED visits increased in almost all States between 2009 and 2014, with the greatest increases in Ohio (106.4 percent), South Dakota (94.7 percent), and Georgia (85.2 percent). 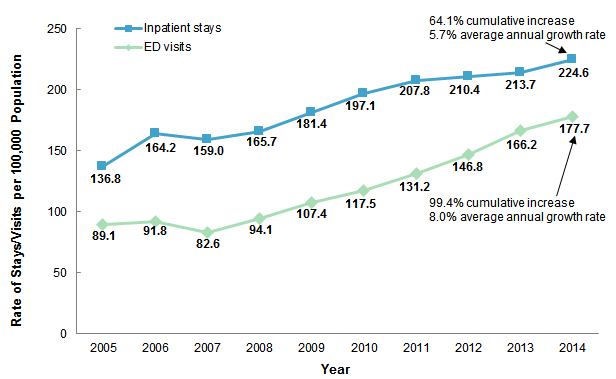 Line graph that shows the rate of inpatient stays and emergency department visits per 100,000 population from 2005 to 2014. Inpatient stays: 2005, 136.8; 2006, 164.2; 2007, 159.0; 2008, 165.7; 2009, 181.4; 2010, 197.1; 2011, 207.8; 2012, 210.4; 2013, 213.7; 2014, 224.6, for a 64.1% cumulative increase and a 5.7% average annual growth rate. Emergency department visits: 2005, 89.1; 2006, 91.8; 2007, 82.6; 2008, 94.1; 2009, 107.4; 2010, 117.5; 2011, 131.2; 2012, 146.8; 2013, 166.2; 2014, 177.7, for a 99.4% cumulative increase and an 8.0% average annual growth rate. Overall, the population rate of opioid-related inpatient stays was higher than the rate of opioid-related ED visits. The rate of increase for opioid-related ED visits was greater than that for opioid-related inpatient stays. Between 2005 and 2014, the rate of opioid-related inpatient stays increased 64.1 percent, from 136.8 per 100,000 population in 2005 to 224.6 per 100,000 population in 2014. This represented a 5.7 percent average annual growth rate. During this same time period, the rate of opioid-related ED visits increased 99.4 percent, from 89.1 per 100,000 population in 2005 to 177.7 per 100,000 population in 2014. This represented an 8.0 percent average annual growth rate. Figure 2 presents the rate per 100,000 population of opioid-related inpatient stays among 43 States and the District of Columbia that provided data in 2014. States are ordered according to their rate of opioid-related stays. Bar chart that shows the rate of opioid-related inpatient stays per 100,000 population by State. Maryland: 403.8; Massachusetts: 393.7; District of Columbia: 388.8; Rhode Island: 377.4; New York: 360.5; West Virginia: 349.3; Connecticut: 337.5; Washington: 313.2; Oregon: 307.0; Illinois: 306.6; Maine: 300.5; Ohio: 292.0; New Jersey: 288.7; Pennsylvania: 285.1; Kentucky: 280.4; Missouri: 261.4; Tennessee: 251.8; Minnesota: 247.2; Arizona: 247.0; Florida: 234.9; Michigan: 229.6; North Carolina: 220.0; New Mexico: 215.4; Montana: 213.6; Wisconsin: 212.8; Utah: 204.4; Vermont: 203.3; Indiana: 196.9; Colorado: 186.1; Nevada: 174.1; California: 168.3; Virginia: 166.6: North Dakota: 161.5; Louisiana: 156.5; Oklahoma: 155.1; Hawaii: 141.5; South Carolina: 141.5; Arkansas: 139.3; South Dakota: 128.3; Georgia: 119.5; Kansas: 104.3; Texas: 98.6; Wyoming: 96.7; Nebraska: 78.6; Iowa: 72.7. National rate of opioid-related stays per 100,000 population: 224.6. The rate of opioid-related inpatient stays varied by a factor of 5.6 across 44 States and the District of Columbia in 2014. The next lowest rates of opioid-related inpatient stays above Iowa were in Nebraska (78.6), Wyoming (96.7), Texas (98.6), and Kansas (104.3). Figure 3 illustrates the percent change in the population rate of opioid-related inpatient stays from 2009 to 2014 among 43 States with data available in both years. States are ordered according to the percent change in their rate of opioid-related stays over the 6-year time period. Note: Percent change could not be calculated for North Dakota or the District of Columbia because data were not available in 2009. Bar chart that shows the cumulative percent change in the rate of opioid-related inpatient stays per 100,000 population by State. Georgia: 99.8; North Carolina: 70.9; Oregon: 60.2; Washington: 60.1; South Dakota: 59.6; Pennsylvania: 58.9; Rhode Island: 54.6; Ohio: 52.0; Utah: 51.0; West Virginia: 49.4; Vermont: 47.4; Tennessee: 42.6; Massachusetts: 41.8; Arizona: 39.9; Florida: 39.3; Virginia: 38.0; Colorado: 36.1; Missouri: 34.4; Indiana: 32.2; South Carolina: 31.7; California: 30.0; Connecticut: 28.5; Hawaii: 27.8; Nevada: 26.3; New Mexico: 25.1; Montana: 24.5; Kentucky: 24.2; Arkansas: 23.8; Michigan: 21.4; Minnesota: 20.7; Wisconsin: 19.1; Oklahoma: 17.2; Wyoming: 16.8; Texas: 15.6; New Jersey: 14.2; Iowa: 11.5; Nebraska: 8.0; New York: 2.9; Maine: 2.7; Louisiana: -4.8; Illinois: -5.5; Maryland: -9.7; Kansas: -18.0. National average: 23.8. Most States had an increase in the rate of opioid-related inpatient stays between 2009 and 2014, with Georgia having the largest increase at 99.8 percent. The vast majority of States (36 of 43 States) had an increase of at least 10 percent in the population-based rate of opioid-related inpatient stays between 2009 and 2014. The largest increases occurred in Georgia (99.8 percent increase), North Carolina (70.9 percent increase), Oregon (60.2 percent increase), Washington (60.1 percent increase), and South Dakota (59.6 percent increase). Six States had a relatively stable rate of opioid-related inpatient stays, with a 6-year change in rate (increase or decrease) of less than 10 percent: Nebraska, New York, Maine, Louisiana, Illinois, and Maryland. 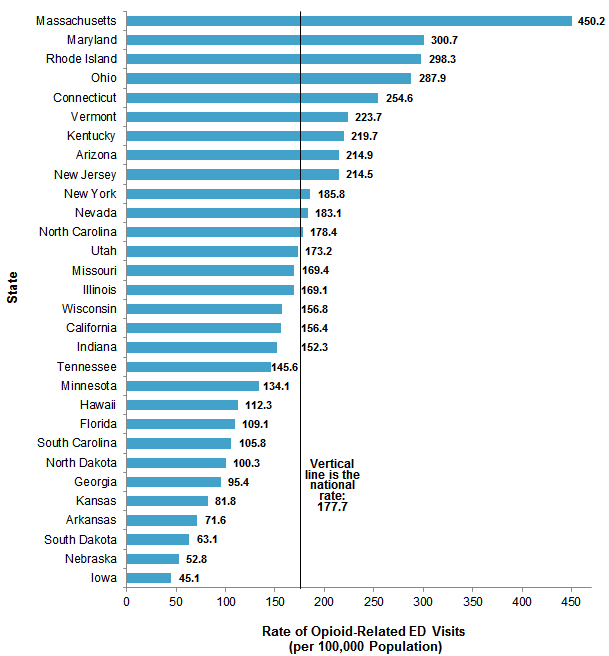 In 2014, New York, Illinois, and Maryland were among the top 10 States in rate of opioid-related inpatient stays, as shown in Figure 2. Only one State, Kansas, showed a substantial decrease in the rate of opioid-related hospital inpatient stays (18.0 percent decrease). In 2014, Kansas was among the States with the lowest rate of opioid-related inpatient stays (104.3 stays per 100,000 population, as shown in Figure 2). Figure 4 presents the rate per 100,000 population of opioid-related ED visits among 30 States that provided data in 2014. States are ordered according to their rate of opioid-related ED visits. Bar chart that shows the rate of opioid-related emergency department visits per 100,000 population by State. Massachusetts: 450.2; Maryland: 300.7; Rhode Island: 298.3; Ohio: 287.9; Connecticut: 254.6; Vermont: 223.7; Kentucky: 219.7; Arizona: 214.9; New Jersey: 214.5; New York: 185.8; Nevada: 183.1; North Carolina: 178.4; Utah: 173.2; Missouri: 169.4; Illinois: 169.1; Wisconsin: 156.8; California: 156.4; Indiana: 152.3; Tennessee: 145.6; Minnesota: 134.1; Hawaii: 112.3; Florida: 109.1; South Carolina: 105.8; North Dakota: 100.3; Georgia: 95.4; Kansas: 81.8; Arkansas: 71.6; South Dakota: 63.1; Nebraska: 52.8; Iowa: 45.1. National average: 177.7. The rate of opioid-related ED visits varied 10-fold across 30 States in 2014. In 2014, the highest rate of opioid-related ED visits was in Massachusetts (450.2 visits per 100,000 population), which was approximately 10 times higher than the lowest rate in Iowa (45.1). 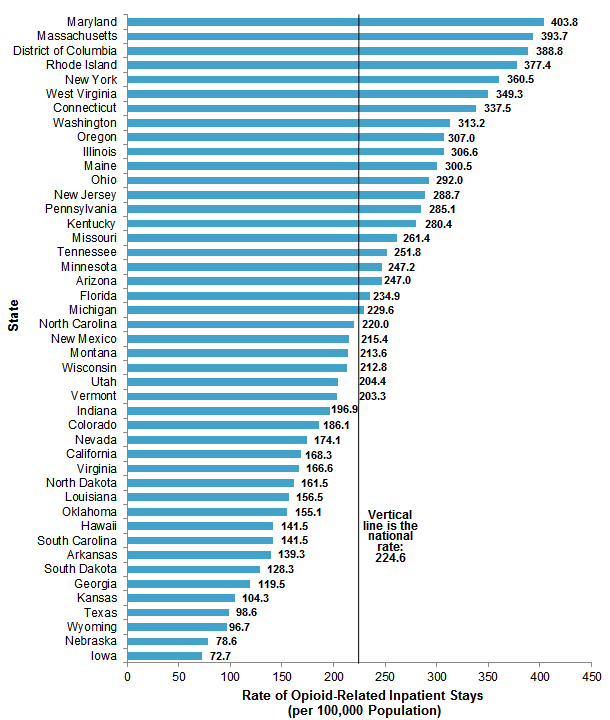 Following Massachusetts, the next highest rates of opioid-related ED visits were in Maryland (300.7), Rhode Island (298.3), Ohio (287.9), and Connecticut (254.6). 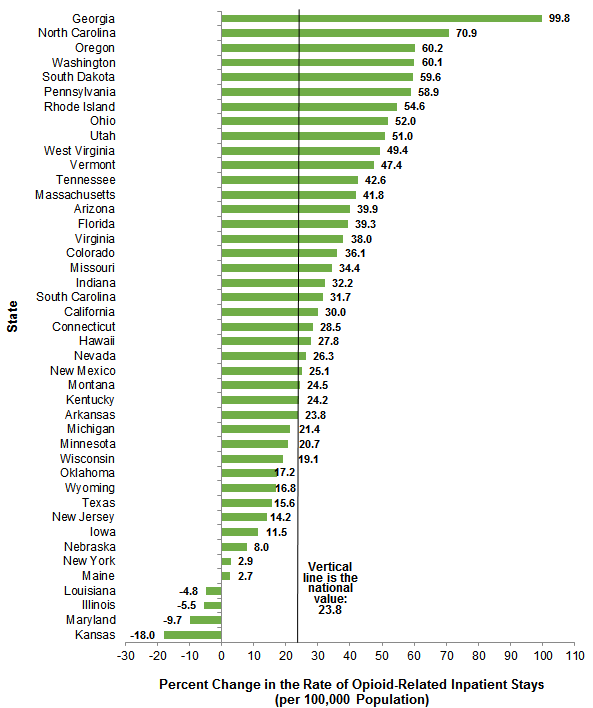 The next lowest rates above Iowa were in Nebraska (52.8), South Dakota (63.1), Arkansas (71.6), and Kansas (81.8). States with the highest opioid-related rate for inpatient stays also tended to have the highest opioid-related rate for ED visits: there was a strong, positive correlation (0.85) between States' opioid-related population rates for inpatient stays and ED visits. Figure 5 illustrates the percent change in the population rate of opioid-related ED visits from 2009 to 2014 among 27 States with data available in both years. States are ordered according to the percent change in their rate of opioid-related ED visits over the 6-year time period. Notes: Percent change could not be calculated for three States (Arkansas, Nevada, North Dakota) because rates were not available in 2009. Bar chart that shows the cumulative percent change in the rate of opioid-related emergency department visits per 100,000 population by State. Ohio: 106.4; South Dakota: 94.7; Georgia: 85.2; Minnesota: 83.3; Illinois: 82.7; Maryland: 81.0; Arizona: 79.7; California: 79.0; Missouri: 77.3; New York: 72.6; Massachusetts: 71.2; Rhode Island: 70.8; Wisconsin: 68.6; Kentucky: 65.6; North Carolina: 55.2; Hawaii: 54.7; Indiana: 54.6; Nebraska: 54.0; South Carolina: 50.3; New Jersey: 48.1; Tennessee: 43.4; Connecticut: 35.1; Florida: 32.3; Vermont: 18.8; Utah: 15.2; Kansas: 11.4; Iowa: -15.6. National average: 65.5. Almost all States had an increase in the rate of opioid-related ED visits between 2009 and 2014, with Ohio having the largest increase at 106.4 percent. Almost all States (26 of 27 States) had an increase of at least 10 percent in the population rate of opioid-related ED visits between 2009 and 2014. The highest rate increases occurred in Ohio (106.4 percent increase), South Dakota (94.7 percent increase), and Georgia (85.2 percent increase). Only one State, Iowa, showed a substantial decrease in the rate of opioid-related ED visits (15.6 percent decrease). 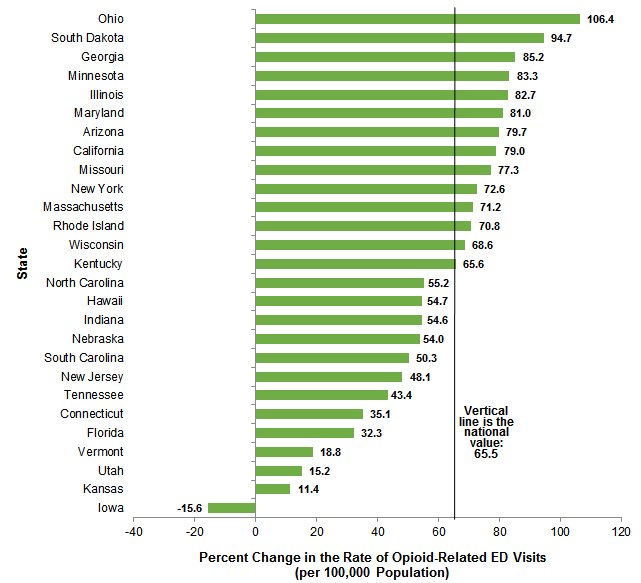 Iowa also had the lowest rate of opioid-related ED visits (45.1 visits per 100,000 population, as shown in Figure 4). Inpatient statistics from HCUP Fast Stats were available for the following 44 individual States and the District of Columbia in 2009 and 2014: Arizona, Arkansas, California, Colorado, Connecticut, District of Columbia (2014 only), Florida, Georgia, Hawaii, Illinois, Indiana, Iowa, Kansas, Kentucky, Louisiana, Maine, Maryland, Massachusetts, Michigan, Minnesota, Missouri, Montana, Nebraska, Nevada, New Jersey, New Mexico, New York, North Carolina, North Dakota (2014 only), Ohio, Oklahoma, Oregon, Pennsylvania, Rhode Island, South Carolina, South Dakota, Tennessee, Texas, Utah, Vermont, Virginia, Washington, West Virginia, Wisconsin, and Wyoming. Emergency department (ED) statistics from HCUP Fast Stats were available for the following 30 individual States in 2009 and 2014: Arizona, Arkansas (2014 only), California, Connecticut, Florida, Georgia, Hawaii, Illinois, Indiana, Iowa, Kansas, Kentucky, Maryland, Massachusetts, Minnesota, Missouri, Nebraska, Nevada (2014 only), New Jersey, New York, North Carolina, North Dakota (2014 only), Ohio, Rhode Island, South Carolina, South Dakota, Tennessee, Utah, Vermont, and Wisconsin. The principal diagnosis is that condition established after study to be chiefly responsible for the patient's admission to the hospital. Secondary diagnoses are concomitant conditions that coexist at the time of admission or develop during the stay. All-listed diagnoses include the principal diagnosis plus these additional secondary conditions. ICD-9-CM is the International Classification of Diseases, Ninth Revision, Clinical Modification, which assigns numeric codes to diagnoses. There are approximately 14,000 ICD-9-CM diagnosis codes. It should be noted that ICD-9-CM diagnosis codes related to opioid dependence or abuse "in remission" were not used to identify opioid-related hospital use because remission does not indicate active use of opioids. Potential changes in the use of ICD-9-CM codes identifying opioid use cannot be isolated in these analyses. The National (Nationwide) Inpatient Sample (NIS) is based on data from community hospitals, which are defined as short-term, non-Federal, general, and other hospitals, excluding hospital units of other institutions (e.g., prisons). The NIS includes obstetrics and gynecology, otolaryngology, orthopedic, cancer, pediatric, public, and academic medical hospitals. Excluded are long-term care facilities such as rehabilitation, psychiatric, and alcoholism and chemical dependency hospitals. Beginning in 2012, long-term acute care hospitals are also excluded. However, if a patient received long-term care, rehabilitation, or treatment for a psychiatric or chemical dependency condition in a community hospital, the discharge record for that stay will be included in the NIS. The Nationwide Emergency Department Sample (NEDS) is based on data from community hospitals, which are defined as short-term, non-Federal, general, and other hospitals, excluding hospital units of other institutions (e.g., prisons). The NEDS includes specialty, pediatric, public, and academic medical hospitals. Excluded are long-term care facilities such as rehabilitation, psychiatric, and alcoholism and chemical dependency hospitals. Hospitals included in the NEDS have hospital-owned emergency departments (EDs) and no more than 90 percent of their ED visits resulting in admission. This analysis used State Inpatient Databases (SID) limited to data from community hospitals, which are defined as short-term, non-Federal, general, and other hospitals, excluding hospital units of other institutions (e.g., prisons). Community hospitals include obstetrics and gynecology, otolaryngology, orthopedic, cancer, pediatric, public, and academic medical hospitals. Excluded for this analysis are long-term care facilities such as rehabilitation, psychiatric, and alcoholism and chemical dependency hospitals. However, if a patient received long-term care, rehabilitation, or treatment for a psychiatric or chemical dependency condition in a community hospital, the discharge record for that stay was included in the analysis. This analysis used State Emergency Department Databases (SEDD) limited to data from community hospitals with a hospital-owned emergency department. Community hospitals are defined as short-term, non-Federal, general, and other hospitals, excluding hospital units of other institutions (e.g., prisons). Community hospitals include specialty, pediatric, public, and academic medical hospitals. Excluded for this analysis are long-term care facilities such as rehabilitation, psychiatric, and alcoholism and chemical dependency hospitals. The unit of analysis for inpatient data is the hospital discharge (i.e., the hospital stay), not a person or patient. This means that a person who is admitted to the hospital multiple times in 1 year will be counted each time as a separate discharge from the hospital. Inpatient stays include those admitted through the emergency department (ED). The unit of analysis for ED data is the ED visit, not a person or patient. This means that a person who is seen in the ED multiple times in 1 year will be counted each time as a separate visit in the ED. ED visits exclude those for patients admitted to the hospital, including patients transferred to other hospitals. Average annual percentage change equals open parenthesis, open parenthesis, end value divided by beginning value, close parenthesis, to the power of 1 divided by change in years, minus 1, close parenthesis, multiplied by 100. The Healthcare Cost and Utilization Project (HCUP, pronounced "H-Cup") is a family of health care databases and related software tools and products developed through a Federal-State-Industry partnership and sponsored by the Agency for Healthcare Research and Quality (AHRQ). HCUP databases bring together the data collection efforts of State data organizations, hospital associations, and private data organizations (HCUP Partners) and the Federal government to create a national information resource of encounter-level health care data. HCUP includes the largest collection of longitudinal hospital care data in the United States, with all-payer, encounter-level information beginning in 1988. These databases enable research on a broad range of health policy issues, including cost and quality of health services, medical practice patterns, access to health care programs, and outcomes of treatments at the national, State, and local market levels. HCUP Statistical Briefs are descriptive summary reports presenting statistics on hospital inpatient, ambulatory surgery, and emergency department use and costs, quality of care, access to care, medical conditions, procedures, patient populations, and other topics. The reports use HCUP administrative health care data. The HCUP National (Nationwide) Inpatient Sample (NIS) is a nationwide database of hospital inpatient stays. The NIS is nationally representative of all community hospitals (i.e., short-term, non-Federal, nonrehabilitation hospitals). The NIS includes all payers. It is drawn from a sampling frame that contains hospitals comprising more than 95 percent of all discharges in the United States. The vast size of the NIS allows the study of topics at the national and regional levels for specific subgroups of patients. In addition, NIS data are standardized across years to facilitate ease of use. Over time, the sampling frame for the NIS has changed; thus, the number of States contributing to the NIS varies from year to year. The NIS is intended for national estimates only; no State-level estimates can be produced. Revisions to the sample design—starting with 2012, the NIS is now a sample of discharge records from all HCUP-participating hospitals, rather than a sample of hospitals from which all discharges were retained (as is the case for NIS years before 2012). Revisions to how hospitals are defined—the NIS now uses the definition of hospitals and discharges supplied by the statewide data organizations that contribute to HCUP, rather than the definitions used by the American Hospital Association (AHA) Annual Survey of Hospitals. The new sampling strategy is expected to result in more precise estimates than those that resulted from the previous NIS design by reducing sampling error: for many estimates, confidence intervals under the new design are about half the length of confidence intervals under the previous design. The change in sample design for 2012 makes it necessary to recalculate prior years' NIS data to enable analyses of trends that use the same definitions of discharges and hospitals. The HCUP Nationwide Emergency Department Database (NEDS) is a unique and powerful database that yields national estimates of emergency department (ED) visits. The NEDS was constructed using records from both the HCUP State Emergency Department Databases (SEDD) and the State Inpatient Databases (SID). The SEDD capture information on ED visits that do not result in an admission (i.e., treat-and-release visits and transfers to another hospital); the SID contain information on patients initially seen in the emergency department and then admitted to the same hospital. The NEDS was created to enable analyses of ED utilization patterns and support public health professionals, administrators, policymakers, and clinicians in their decisionmaking regarding this critical source of care. The NEDS is produced annually beginning in 2006. Over time, the sampling frame for the NEDS has changed; thus, the number of States contributing to the NEDS varies from year to year. The NEDS is intended for national estimates only; no State-level estimates can be produced. The HCUP State Inpatient Databases (SID) are hospital inpatient databases from data organizations participating in HCUP. The SID contain the universe of the inpatient discharge abstracts in the participating HCUP States, translated into a uniform format to facilitate multistate comparisons and analyses. Together, the SID encompass more than 95 percent of all U.S. community hospital discharges. The SID can be used to investigate questions unique to one State, to compare data from two or more States, to conduct market-area variation analyses, and to identify State-specific trends in inpatient care utilization, access, charges, and outcomes. The HCUP State Emergency Department Databases (SEDD) include information from hospital-owned emergency departments (EDs) from data organizations participating in HCUP, translated into a uniform format to facilitate multistate comparisons and analyses. The SEDD capture information on ED visits that do not result in an admission to the same hospital (i.e., patients who are treated in the ED and then discharged, transferred to another hospital, left against medical advice, or died). The SEDD contain a core set of clinical and nonclinical information on all patients, including individuals covered by Medicare, Medicaid, or private insurance, as well as those who are uninsured. The SEDD can be used to investigate questions unique to one State, to compare data from two or more States, to conduct market-area variation analyses, and to identify State-specific trends in injury surveillance, emerging infections, and other conditions treated in the ED. HCUP Fast Stats is an interactive, online tool that provides easy access to HCUP-based statistics for select State and national health information topics. HCUP Fast Stats uses side-by-side comparisons of visual statistical displays, trend figures, or simple tables to convey complex information at a glance. Topics currently available in HCUP Fast Stats include the Effect of Health Insurance Expansion on Hospital Use by State; National Hospital Utilization and Costs; and Opioid-Related Hospital Use, National and State. HCUP Fast Stats presents statistics using data from HCUP's National (Nationwide) Inpatient Sample (NIS), the Nationwide Emergency Department Sample (NEDS), the State Inpatient Databases (SID), and the State Emergency Department Databases (SEDD). For other information on malnutrition-related hospital stays in the United States, refer to the HCUP Statistical Briefs located at http://www.hcup-us.ahrq.gov/reports/statbriefs/sb_mhsa.jsp. For more information about HCUP, visit http://www.hcup-us.ahrq.gov/. Agency for Healthcare Research and Quality. Overview of the National (Nationwide) Inpatient Sample (NIS). Healthcare Cost and Utilization Project (HCUP). Rockville, MD: Agency for Healthcare Research and Quality. Updated November 2015. http://www.hcup-us.ahrq.gov/nisoverview.jsp. Accessed February 17, 2016. Agency for Healthcare Research and Quality. Overview of the Nationwide Emergency Department Sample (NEDS). Healthcare Cost and Utilization Project (HCUP). Rockville, MD: Agency for Healthcare Research and Quality. Updated January 2016. http://www.hcup-us.ahrq.gov/nedsoverview.jsp. Accessed February 17, 2016. Agency for Healthcare Research and Quality. Overview of the State Inpatient Databases (SID). Healthcare Cost and Utilization Project (HCUP). Rockville, MD: Agency for Healthcare Research and Quality. Updated January 2016. http://www.hcup-us.ahrq.gov/sidoverview.jsp. Accessed February 17, 2016. Agency for Healthcare Research and Quality. Overview of the State Emergency Department Databases (SEDD). Healthcare Cost and Utilization Project (HCUP). Rockville, MD: Agency for Healthcare Research and Quality. Updated January 2016. http://www.hcup-us.ahrq.gov/seddoverview.jsp. Accessed February 17, 2016. Weiss AJ (Truven Health Analytic), Elixhauser A (AHRQ), Barrett ML (M.L. Barrett, Inc.), Steiner CA (AHRQ), Bailey MK (Truven Health Analytics), O'Malley L (Truven Health Analytics). Opioid-Related Inpatient Stays and Emergency Department Visits by State, 2009-2014. HCUP Statistical Brief #219. December 2016. Agency for Healthcare Research and Quality, Rockville, MD. http://www.hcup-us.ahrq.gov/reports/statbriefs/sb219-Opioid-Hospital-Stays-ED-Visits-by-State.pdf. The authors would like to acknowledge the contributions of Brian Eppert of Coding Leap, LLC, and Minya Sheng of Truven Health Analytics. This Statistical Brief was posted online on December 15, 2016.
the revised version of this Statistical Brief was posted online on January 26, 2017. * This Statistical Brief was revised to include opioid-related external cause of injury codes (E codes) for accidental poisoning and adverse effects (E850.0-E850.2, E935.0-E935.2, E940.1) in the calculation of the State-level rates. This affected the number of inpatient stays and emergency department (ED) visits involving opioids at the State level, resulting in an increase in the rates reported for all States. Consequently, some shifts occurred in the rankings among States, both in the 2014 rate and in the percent change in rate between 2009 and 2014. Additionally, Maine was added to the list of States reported with inpatient data. The numbers for national rates, both inpatient and ED, are unchanged as E codes were included originally for national estimates. 1 Rudd RA, Aleshire N, Zibbell JE, Gladden RM. Increases in drug and opioid overdose deaths—United States 2000-2014. Morbidity and Mortality Weekly Report. 2016;64:1374-82. 3 Owens PL, Barrett ML, Weiss AJ, Washington RE, Kronick R. Hospital Inpatient Utilization Related to Opioid Overuse Among Adults, 1993-2012. HCUP Statistical Brief #177. August 2014. Agency for Healthcare Research and Quality, Rockville, MD. https://www.hcup-us.ahrq.gov/reports/statbriefs/sb177-Hospitalizations-for-Opioid-Overuse.jsp. Accessed December 1, 2016. 4 U.S. Department of Health and Human Services. The U.S. Opioid Epidemic. Updated October 31, 2016. http://www.hhs.gov/opioids/about-the-epidemic/#us-epidemic. Accessed December 1, 2016. 5 U.S. Department of Health and Human Services. Opioid Abuse in the U.S. and HHS Actions to Address Opioid-Drug Related Overdoses and Deaths. March 26, 2015. https://aspe.hhs.gov/basic-report/opioid-abuse-us-and-hhs-actions-address-opioid-drug-related-overdoses-and-deaths. Accessed December 1, 2016. 6 Agency for Healthcare Research and Quality. HCUP Fast Stats Web site, Opioid-Related Hospital Use path. http://www.hcup-us.ahrq.gov/faststats/landing.jsp. Accessed January 26, 2017. 7 Agency for Healthcare Research and Quality. HCUP Fast Stats Web site, Opioid-Related Hospital Use path. http://www.hcup-us.ahrq.gov/faststats/landing.jsp. Accessed January 26, 2017. Internet Citation: Statistical Brief #219. Healthcare Cost and Utilization Project (HCUP). February 2017. Agency for Healthcare Research and Quality, Rockville, MD. www.hcup-us.ahrq.gov/reports/statbriefs/sb219-Opioid-Hospital-Stays-ED-Visits-by-State.jsp.